I found Notebooks From a Middle School Princess by Meg Cabot to be utterly adorable. I was always going to be hugely excited about a new Princess Diaries spin-off series and this first book in the series does a great job of introducing us to new (and old!) characters and a new setting for a brand-new middle grade audience. At the same time as being very, very excited, I was also a little bit nervous that this spin-off series featuring Mia's long-lost half-sister, Olivia Grace, would feel very samey to what I've already read in the Princess Diaries series. It was a tough one. I think I wanted more of the writing style and sense of humour of the Princess Diaries series... but something different too. It's a very fine line, but I think Meg Cabot did a brilliant job of doing just that. In this book, we're introduced to Olivia, a rather adorable middle school girl whose mother has died and who has never really known her father. She's written letters back and forth with him but knows very little about her dad. So little that Olivia resorts to making up a story about him and his life, pretending that he's an archaeologist who travels the world and therefore is unable to provide a safe and stable home for her. And she's okay with that. Even when she lives with her aunt and uncle and her cousins, none of whom are particularly that friendly with her. I thought Olivia was quite sweet, with her interest in animals and particularly wildlife illustrations. This book is wonderfully illustrated by Meg Cabot herself and features quite a lot of cute drawings of animals and her observations on the events around her. She's quite plucky and interesting and she takes everything in her stride really well. I liked that about her. She's not had an easy time of things. She's being picked on at school by a girl jealous of her new fame and royal connections, she's clearly not treated very well at home. The media start speculating about the fact that she's mixed race and my heart broke for her. I was brought to tears quite often when Olivia finds such happiness in the smallest of things: a salmon and cheese bagel, the idea of a proper family. It was also, of course, incredibly nice to see the return of some of my favourite characters. Especially Mia and Grandmere. I loved being back in this world and discovering more about the new characters and the old. This is very much the first book in the series and spends a great deal of time with introductions and laying out the future books in the series as Olivia will be carrying out her own princess lessons but instead of New York, she'll be spending hers in Genovia and I, for one, cannot wait to read more. 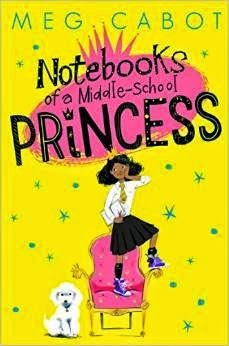 Notebooks From A Middle School Princess is the funny, sweet and adorable new story that will have you smiling and laughing and feeling very emotional for this newest Genovian princess!